TRANSCRIPTS BEACHES & COASTLINES T.O.T.L. 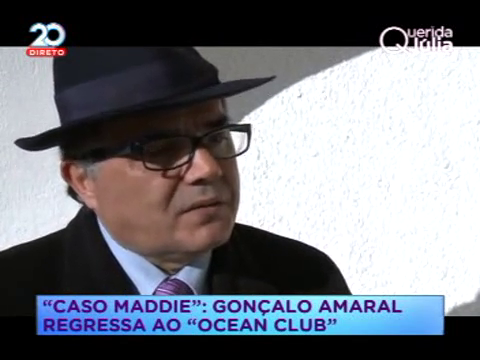 Maddie Case: Goncalo Amaral returns to the "Ocean Club"
From 0:00 to 2:10 - Extracts from "Ate a Verdade"[To the Truth] show where two Canadians psychics share their experiences regarding Madeleine McCann case with Rita Ferro Rodrigues (English). 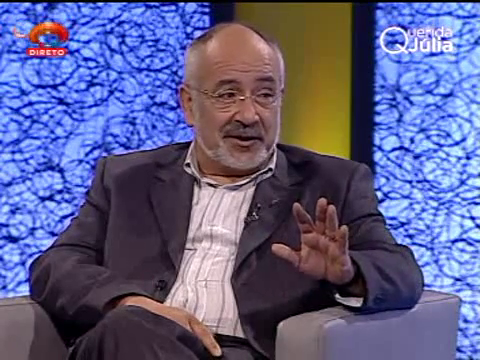 2:10 - Extract from that same show with Criminologist Francisco Moita Flores [FMF] comment: "It is surprising for someone to discover the golf course and a ravine, a ravine with a steep downslide... I don't know, I believe the ravine is important. I would look at it again. Rita Ferro Rodrigues [RFR]: Francisco, if you were the investigator you would look at it again? FMF: It's always good to have a look again, regardless of the provenance of the information, where one has searched before. 2:40 - Cut to Julia Pinheiro's morning talk show. 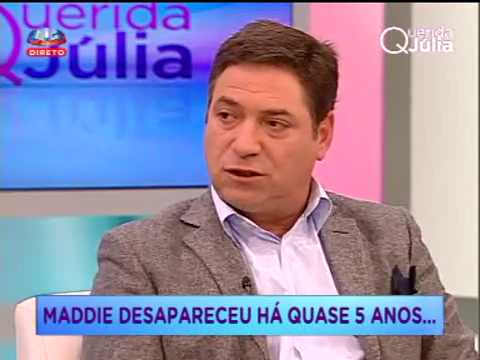 Julia Pinheiro [JP]: Those were the mediums of "Ate a Verdade" on the Madeleine McCann case. Hello, Hernani. Hernani Carvalho [HC]: Good afternoon, dear Julia. JP: Good afternoon, dear Hernani. Would you like to make a comment on the information that we just watched? JP: In the Anglo-Saxon culture, namely in England, that also happens. JP: Specifically these same mediums. HC: Precisely. In England, and in Canada, as you said, in the Anglo-Saxon culture this is also used. JP: These gentlemen are Canadian. JP: We have Goncalo Amaral sitting next to you. 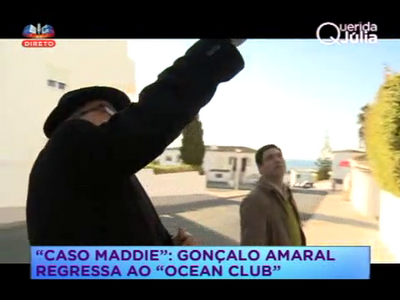 04:40 - [Lower Third] To follow: Goncalo Amaral returns to Praia da Luz. HC: Exactly, this was just until he arrived. Goncalo Amaral [GA]: Good afternoon. HC: And the first question is, Goncalo, did you receive or not information from these people who have a special "phone" to the other side and if you did, did you take that into account or not? GA: In cases like this one, it is very common for messages to appear, several information, some of which were staggering for the... - for example, a drawing that I remember, an image, it was a figure of a person who resembles someone who would appear in the case. Later on, I am able to say who it was. Nevertheless, we the investigators are men of facts. We rely on facts, in indicia, and we are to some extent sceptic regarding these situations. HC: So you received that kind of information? JP: That was the FBI first procedural step? GA: But it was not those gentlemen [reference to the Canadian mediums who appeared in "Ate a Verdade" show]. JP: No, it wasn't them, it was a woman. They collaborate with investigations in the US and in Canada, which is where they live and where they are university professors in a university where these lines of investigations are seen as pertinent. Whilst in reality, in our southern European culture is not [seen as relevant]. 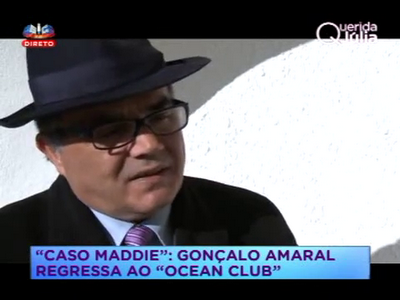 But let's move to the facts, Goncalo Amaral spoke about facts. In May it will be the 5th anniversary of Madeleine McCann's disappearance, fact. 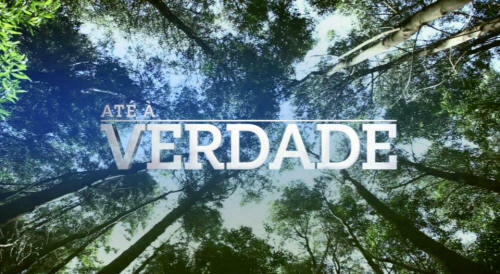 Goncalo Amaral and Hernani Carvalho returned to Praia da Luz and to the ravine, the one mentioned by the mediums in the "Ate a Verdade" show. 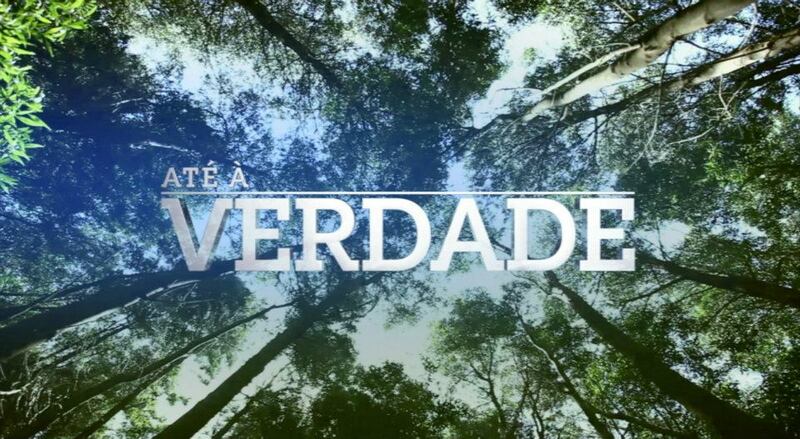 Let's watch it. 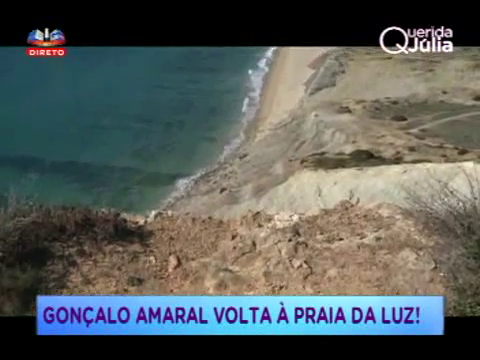 07:14: Cut to Hernani Carvalho at the top of the ravine, in Praia da Luz. 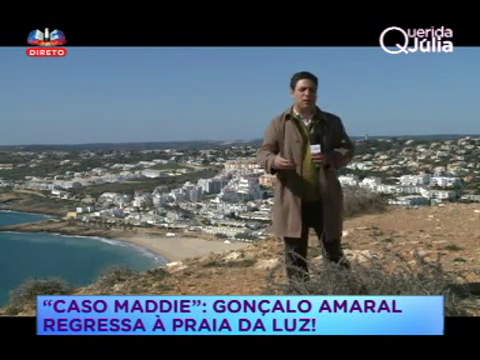 [Lower Third] "Maddie Case": Goncalo Amaral returns to Praia da Luz! HC: Some of the key points mentioned in the TV program broadcast by SIC a few days ago were precisely the beach and this ravine, and also a golf course and all that makes sense with a thesis emerged in May 2007, that said that the little girl could have been carried inside a sports bag or in a golf bag, brought trough the golf course to this ravine and then thrown here. Moita Flores said, in that show, that in doubt he would also come back here. 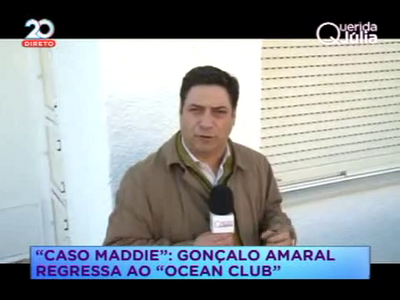 Goncalo Amaral, what did the police do here in Praia da Luz? HC: But also the rocks down here? HC: Are you referring to Maddie's father? GA: To Gerald McCann. Maddie's father. HC: He was walking around here, in the rocks bellow? GA: Yes, there are pictures of that. HC: But in that case, he would have to have the firm belief that the girl was dead. GA: I do not believe that he was looking for crabs nor searching for a live daughter. According to Moita Flores, it would be important to return to this area, I believe so, even because there are people who continue to say today that the body might be around here, and continue to give information about places. It should be looked, the police should make searches, they should reopen the process and resume the investigations. There is much to be done still. JP: Hernani, I hand over to you the first comments. JP: In a golf bag. JP: Let me just show the picture. 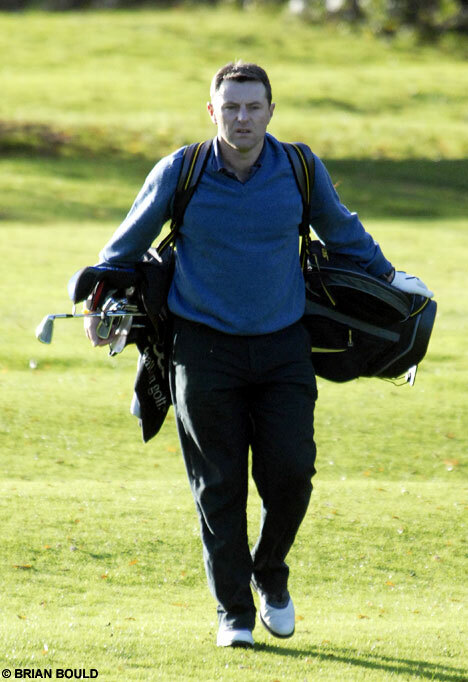 [Behind HC and GA there is a flat TV screen, Gerald McCann carrying a Golf bag is shown] Here it is, Gerry McCann with the golf bag, I have to stress that this picture was taken by a British photojournalist, Brian Bould. HC: Without prejudice, I am not saying that it was Mr. McCann, it's different. What I am saying is, in the hypothesis - which was one of the theses at that time - that the girl was taken from the bedroom, carried inside a golf bag, or inside a sports bag, by whomever made her leave the bedroom, and then carried her through the golf field to the cliff... We already know, and it is not difficult to understand, that is not possible to throw a 30 kilos2 body from that point, because the body would never fall inside water, never. With a small rock, a rock with the size of a hand, it is impossible to toss it into the ocean. So, the question is, would it be possible for the girl to have been kept hidden at the cliff area and then be taken from there? HC: We will speak about the FSS later on. HC: But the question is, how is it possible to keep a body in that cliff without cadaver deterioration? GA: In that place the body would always decay. The issue with the bag is the following, Gerald McCann said at one point in time that he did not have any sports bag. Mark Harrison, an English expert, who did the planning of the searches that were carried out with the CSI dogs, of the cadaver odour and blood, at the ends of July, early August, puts forward that serious hypothesis - that the body was taken inside a sports bag3, he speaks of a golf bag, of a sports bag - and indeed a sports bag existed. 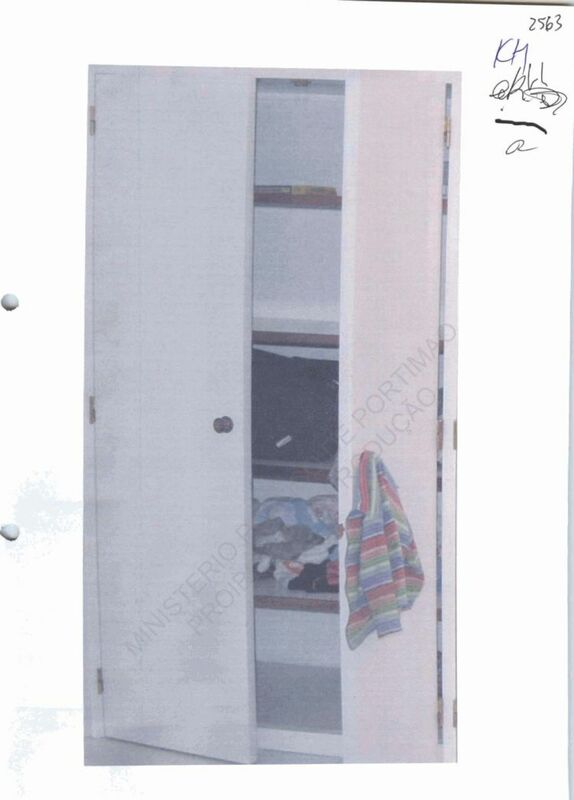 There are photographs taken inside the apartment [rented by the McCanns/5A] immediately after the disappearance, an hour later, and the sports bag is there, inside the closet and is of a darkish blue colour. Thus, those photographs exist, contrary to what anyone can say that they did not own a sports bag - the sports bag was there. A sports bag, even though there wasn't any brand like "Adidas" in the bag, but it was a bag of that kind. So, what happened to that bag, what took place next, other situations ensued relatively to another bag, something that it's not worth mentioning now here, there are people who also talk about a bag... That cliff area is an important zone, several people talked about it, there were many important events that took place there, events that people saw and suspected, in the golf course area, in the path to the geodesic mark, all in that area. Therefore, it is an area where it is worthwhile to make a search again. But to be searched in the scope of an investigation that is reopened. HC: Curiously, the whole area was thoroughly examined, that should be said. HC: The whole area was examined, the whole area was acquired, the whole area was divided? GA: There is an important detail? HC: You do not have access to that area, because today you can see that certain parts are private, curiously, almost in the path that goes to the cliff's escarpment. GA: There is an important aspect and that is the diary of Mrs Kate McCann. There are some who have the opinion the diary was written to be read. At a certain point in time, following the dates given there just a few days after the disappearance, Mrs. Kate McCann says that she is running, doing her jogging ? the daughter is missing and she is doing her training ? and in there, in that plateau that we are seeing right now, she said that she was climbing it when she saw a number of journalists, of people and that she begun suspecting that the body of her daughter had been found. That is in her diary. She points to that area. When they have hired? HC: But pointing to that place, is using as basis that the child has lost her life?! GA: Exactly, it was always like that, since the beginning the parents, at least Kate McCann, have always spoken about the death of the child. Those emails that they delivered [to the PJ] of a clairvoyant that explained where the body could be, beneath the church area, inside a sewer collector. HC: I cannot agree with that? I believe it was Gerry. Gerry said, ?If you think the girl is dead then show me her body?. GA: Well, perhaps he knows that there is no body. That is another question; I do not know why he says that there must be a body. In order to prove that the child is dead it is not necessary to have a body. Actually, in this case, if we could abstract ourselves of the name of the child that disappeared, of the child's parents and just look at the facts, in an objective manner and move forward with the investigation, facts would speak for themselves! There is no point in saying that the child is dead, or that the child is alive, what we need is to work the investigation and carry it out to the end, something that was not done. Let us forget for a few moments who is Madeleine McCann, who are Madeleine McCann's parents, and let us look at the facts objectively. At facts that are in a process, that some have already tried to dismiss as being historical, as if the process had no importance. We will only know the truth ? and that is what matters - and in that truth we will know if the child is alive or dead, and where she can be, what happened to her; if we proceed based on those facts. HC: But it is the parent's conviction, or at least is the conviction that is best known, that the child is missing and the parents have reiterated that they believe the child is alive. GA: I don't think so? JP: That she is alive? GA: I don't think so, and I'll tell you why. I will give you an example, Hernani. There was a certain lawyer, who went to dams searching for a body. Metodo 3, an investigation agency that worked for the couple, hired that lawyer, to link two cases, the Joana Cipriano case and the Madeleine case. He was searching for a body. Today, defending him, in a libel suit that I have moved against him is the McCann's lawyer [Isabel Duarte]. So if he says the child is dead 4, why are the McCanns' defending him? Why are the McCanns in court [against me]? This is the kind of contradictions that no one understands? JP: Indeed no one understands that. Let us watch now? HC: Let us go to the apartment. JP: Let us go to the apartment. Let us tackle the facts, the facts mentioned by Goncalo Amaral. JP: Fact: May, five years since Madeleine McCann disappeared. After we saw the considerations made by the mediums in the TV program ?Ate ? Verdade?, we are going to ask someone who was involved in the process, Goncalo Amaral and Hernani Carvalho our man on the field. 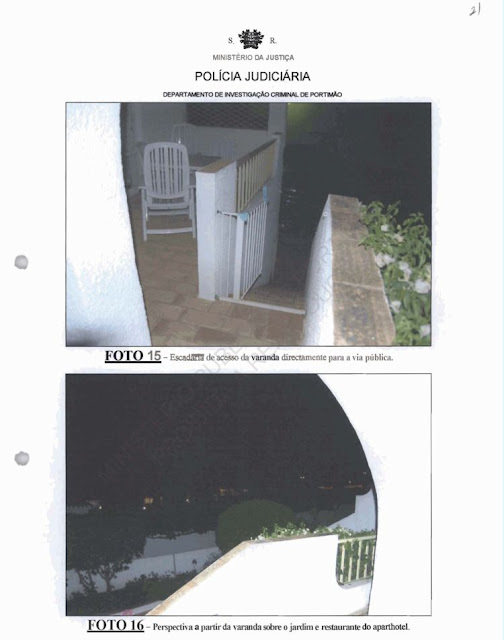 They have returned to Praia da Luz to the very place, to the bedroom door, from where the child disappeared. 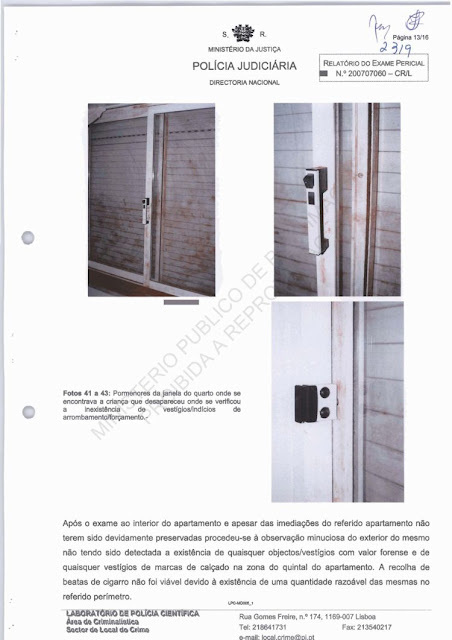 HC: Madeleine McCann disappeared on the 3rd of May of 2007 from this apartment in Praia da Luz. From the apartment 5A of the Ocean Club. Moita Flores, for example, does not believe the child could have been taken through this window. In fact, the window is right next to the door [HC points to the door right next to him, turns to Goncalo Amaral and asks him] Objectively, I would ask you if, in your perception, would it be possible for the little girl to have disappeared through this window? GA: It is our conviction, and from the indicia that were collected during those initial months, that it would be materially impossible for this window to be the means of entry or exit, particularly since there are no traces of a break-in. What we have instead are vestiges of a simulation inside - namely a simulation5 where the window is opened. There are fingerprints of Kate McCann opening the window towards her left hand-side, whereas she says the window has always been closed, with the shutters always down and therefore all these... There are no footprints or anything similar. Undeniably, this window, as I have said before, is a window ?facing the world' and it is where the solution of the case lies. HC: As the investigators put it, no one enters through a door and then exits through a window! GA: It is a fact and if you watch closely, the door it is less exposed than the window. It would be much more spectacular to exit through the window rather than the door, which is rather more hidden, more receded than the window. Therefore, this door would be a more obvious away to exit. 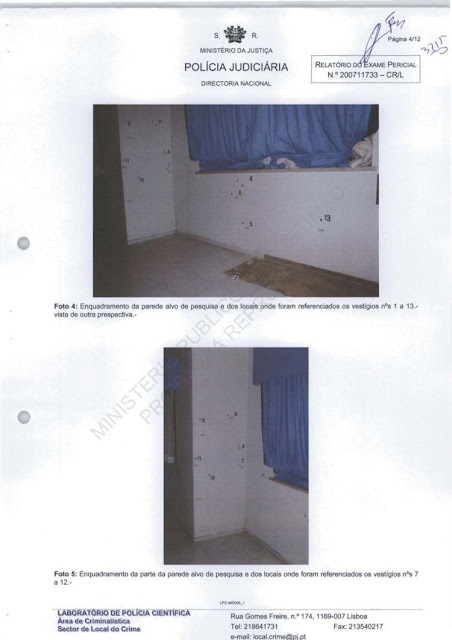 GA: That is the other window where inside is that sofa where blood vestiges were found, which the FSS said that it could belong to Madeleine McCann? GA: Yes, on the inside. HC: Where the blood vestiges were found by the floor? GA Yes, by the floor and where there was also cadaver odour, besides the blood. 19:11 Camera pans briefly at the rear of Apartment's 5A [garden corner where cadaver odour was also detected] before focusing in the rear access staircase to the same living room area GA was just referring to. Immediately afterwards GA and HC enter the small gate that opens directly to a public road and climb the stairs. HC: So, this was usually the service entrance; the street access of apartment 5A, right? GA: Exactly, the apartments, or rather the manner in which that group of tourists entered their apartments was from the rear; both the McCann couple as well as the others, which were on the ground-floor, on the other side. This raises questions such as? The path that is there [pointing towards the alleyway] was the one used by the other members. When Jane Tanner said that she goes up the street, and walks around in order to go home, that to us rings hollow because this was the usual pathway. Gerald McCann himself goes as far as to say that when he came to see his daughter at about 9pm, that he does not enter through here [sliding doors]; even though he was in a hurry to reach the bathroom. Yet he chooses to walk the longest path [round gesture with extended arm], to open the door [main entrance] with the key. There is a report from Control Risks6, the first private detective agency which was brought to the case [by the McCanns] in the very first days, where they state, after speaking with Gerald McCann and other witnesses in that group [Tapas 9], that the key that Mr. Gerald McCann alleges to have used had in fact been left in the kitchen, in the kitchen's counter. Right away, the lies started. Moreover, in order to have an abductor he would have had to enter through here [sliding doors]. Apart from the fact that there are no traces of a break-in, there aren't any fingerprints, he could have used gloves for example, in any case the entry would have to be done through here. There are no signs of a forced entry anywhere; not in the door nor in the window. There is a simulation, as if someone wishes to make others believe that the bedroom window was the passage point of the child, which, in our firm belief, could not have taken place. HC: The parents have said that they were able to keep an eye on the apartment from the restaurant [Tapas] but that is hard to see how, particularly bearing in mind that it was night. 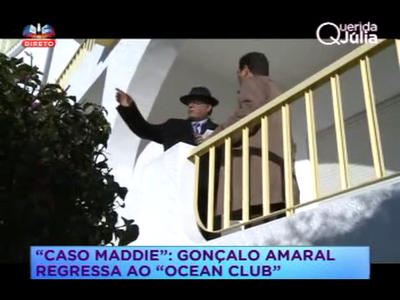 Goncalo Amaral, Dr. Moita Flores, said a few days ago, publicly, that it is his profound belief that Maddie likely died in this apartment, what is your conclusion? GA: My conviction is identical, based on the evidence. [small cut/edit at 21:09] So, exactly what happened? There are the blood vestiges, the cadaver odour that appeared precisely in the place where the blood was, that appeared in the couple's bedroom, that appeared here [pointing to the apartment's backyard] in the shrubs that were there, at the back. Add to that the contradictions and the inconsistencies of all the testimonies, and then there is something that should have been made, the reconstruction of the events, which was refused by the witnesses, by the [McCann] friends; the couple never came back for it and until today that remains to be done. That would be enlightening. GA: The investigation process should not have ended, in October , in the way that it did. From then on, it was six months up to the archival, and today continues to be archived. The answer for the case is in that investigation, that is there, gaining dust, stored in a court archive until it's ?dead'. Or maybe, until someone is brave enough to order the reopening of the process, and continue the investigation. JP: Hernani, You have spoken a while ago about something public, that I myself don't understand how it's related to this: hairs? HC: Yes. I don't know if you remember this, of the times that we worked together on this case? In other times. HC: Suddenly, Madeleine's hairs where all over the place! Hairs were sent to the FSS, hairs were sent to the Lab, hairs were sent to the police, hairs everywhere. HC: Please explain, how is it possible for a child who disappeared to have so much hair? GA: I don't know, but it is a fact that there were several hairs, that were sent, and the conclusion is that they likely belonged to the child. Even the hairs that appeared in the boot of the car rented 20 days later [by the McCanns], they were sent to the FSS [Forensic Science Service]. Hairs that? HC: Is it possible for me to have a hair and than say ?this hair belongs to Mr. Jos?Ant?io? [figure of speech]? GA: I was about to explain that. The FSS stated that due to the hair tone, they belonged to Madeleine McCann, but that they couldn't extract the DNA because the hairs did not have any roots. Nowadays, labs in Europe can actually extract DNA without the roots, and arrive to a conclusion, if the DNA belongs to that person or not. Furthermore, those hairs can help us understand if the child - like her grandfather said, some journalists also said that at the time - did take an antihistaminic in order to sleep at night. And then consider the influence that it could have produced. Those hairs, if they still exist and if they do belong to Madeleine, and if she was indeed ? her siblings never woke up in that night ? given, like her grandfather said in the English television; if the McCanns gave the children Calpol7 at night in order for them, or for the little girl to sleep? From that point on, we might be able to arrive to a conclusion regarding what happened. When they write in a book that the girl's sleeping disorders had ended years ago, that is a lie, since the problems that concern that child, existed to the last day, to the day of her disappearance. And there is evidence that establishes that. HC: Goncalo, I have to tell you this, and you know that this is public. Since the beginning, I have always thought that it was very strange that Madeleine disappeared; but there were several conclusions that one could formulate particularly due to the other two children that did not disappear. However, there is a question ? and we are already without time to continue ? there is a question that I must ask: Who decided that the FSS should be the one, instead of any other forensic lab, to make all those analysis? GA: The Police Directorate, we wanted to ?trust' in the English police? HC: That is all that I wanted to know! Okay! HC: It was just that. There are several excellent laboratories, famous all over the world in Switzerland, in? HC: ?it had to be in England! GA: It is similar to the non-arrival of the FBI, we didn't want to create friction, a ?diplomatic incident?. JP: It was due to a diplomatic settlement that everything turned out the way it did. GA: It is due to diplomacy that we are now here. JC: I thank Goncalo Amaral - who was truly committed to this case - for coming here today, for clarifying and for providing us with information regarding some aspects of this case.